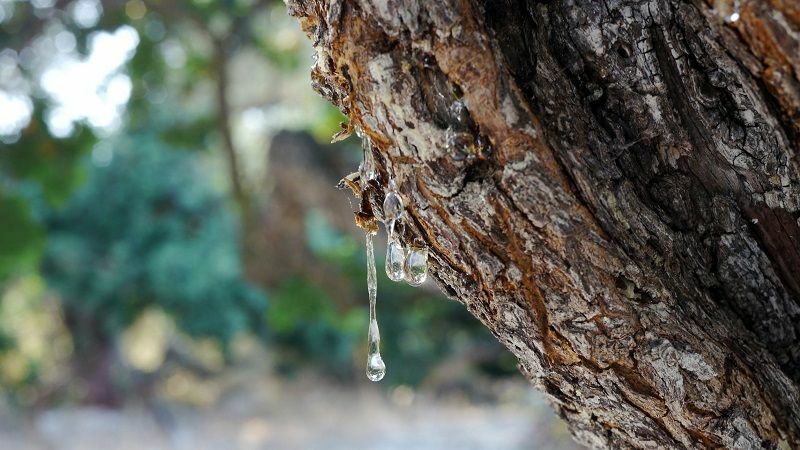 Mastic gum (also called Mastagi Roomi) is plant resin (sap) from the trunk of Pistacia Lentiscus. In Ayurveda and Unani medicine, it is widely used for its ulcer healing, antispasmodic and aphrodisiac action. It reduces menstrual pains and muscular pains. It is useful for the treatment of heartburn, gastritis, ulcers and indigestion. 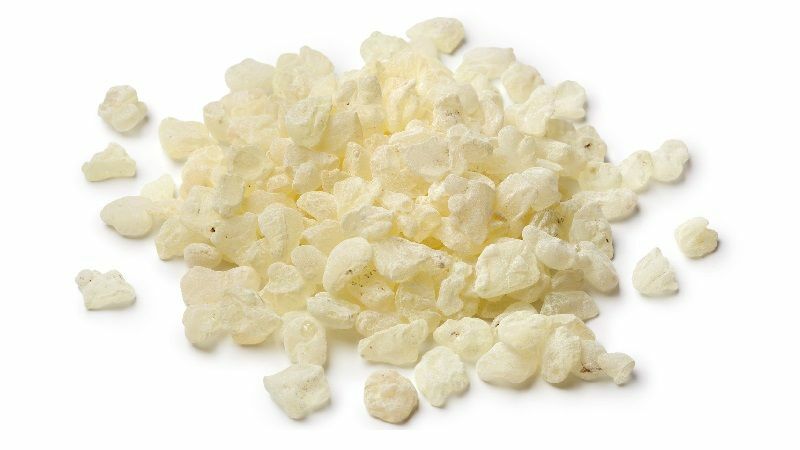 Mastic Gum (also called Mastagi Roomi or Mastagi Rumi) is used in preparing medicines and for therapeutic uses. It is collected from the trunk of Pistacia Lentiscus (Mastic Tree). Mastic Gum is light yellow in color and it has light sweet taste and sweet fragrance. Mastic Gum contains essential oils about 1 to 3%. The other active principle is MASTICONIC ACID. The following active components are also found in Mastic Gum and mastic oil. Antibacterial activity is possibly due to traces components. The significant antimicrobial activity is observed with mastic oil on Bacillus subtilis, Escherichia coli and Staphylococcus Aureus. All components appear to be working synergistically for antibacterial and antifungal characteristics of the mastic gum and mastic oil. Mastic Gum has following healing properties. Mastic gum is helpful in following health conditions. Mastic gum is found in Unani medicinal formulations, which Dysuria, excessive salivation, ulcer, backache, etc. Mastic Gum provides strength to the stomach and intestines. It makes a protective layer on the linings of the stomach, which protects from hyperacidity. Appetite stimulant action increases appetite. Carminative action provides relief from flatulence and abdominal distension. In general, it is a health tonic and helps in general debility when used with Ashwagandha. Mastic gum is an effective treatment for bad breath. Chewing mastic gum helps freshening up the breath and removes bad mouth odor. The antimicrobial action of Mastic gum reduces microbes in the mouth responsible for bad breath. Most bacteria grow in the mouth due to the breakdown of food particles in the mouth. This reaction produces foul odor in the mouth. The second most cause is poor dental hygiene. Chewing Mastic gum removes food particles, inhibits growth of bacteria due to antibacterial action and clears up the teeth, which ultimately reduces bad breath and makes oneself feeling fresh again. Dried mastic gum powder is useful for removing dental plaque naturally. Mastic gum toothpowder also strengthens the gums and teeth, which helps preventing early tooth loss. The following toothpowder helps prevent all types of dental problems and cures bad breath, pyorrhea, toothache and yellowness of teeth. Mastic gum appears to reduce the gastric acid in the stomach. Generally, 500 mg mastic gum is used with 1000 mg licorice powder to get immediate relief from the heartburn. In ayurveda, in addition to mastic gum and licorice, Amla and Praval Pishti and Mukta Pishti are added to increase the effectiveness of the Heartburn and Indigestion treatment. 2 to 4 weeks therapy with this combination cures indigestion (dyspepsia) and heartburn. Mastic gum has mild anti-inflammatory action on stomach linings. To increase its anti-inflammatory action, it is used in combination with licorice and Vanshlochan (Bamboo Manna). Gastroesophageal Reflux (GERD) is actually caused by the weakness of the lower esophageal sphincter valve, which cause acid reflux. In such case, mastic gum is very useful for providing strength to the valves. Further, it also has antacid action, which reduces symptoms of GERD. Mastic gum powder fights off Helicobacter Pylori, ulcer-causing bacteria. It has potential inhibiting and bacteriolytic action against H. Pylori. Recent studies have shown Mastic gum effectiveness in stomach as well as intestinal ulcers. Mastic gum is also effective in other causes of ulcer, which may include use of NSAIDs and other medicines that may result in erosion of gastric or intestinal mucosa. Mastic gum builds a protective layer on linings of stomach and intestines, which prevents and treats ulcers. However, mastic gum alone works well in curing ulcers, but adding licorice and Amla, and Vanshlochan (Bamboo Manna) speeds up recovery. The following mastic gum combination is more helpful in peptic and duodenal ulcers. * Quantity is for a single dose. This combination can be taken thrice a day for maximum benefits. The recommended therapy duration with this combination in ulcer is about 8 weeks. It heals ulcer, prevents recurrence and reduces ulcer symptoms and abdominal pain. Mastic gum is a potent alternative medicine for ulcerative colitis. 3 to 6 months therapy with Mastic gum alleviates all symptoms of ulcerative colitis. For more results, the following Mastic combination is helpful. * Quantity is for a single dose. This mastic gum combination can be taken twice or thrice a day for at least 3 months. Mastic gum with Gum Acacia and Chandraprabha Vati is beneficial for children suffering with bed-wetting or enuresis. The same formulation containing mastic gum and gum acacia and Shilajit or Chandraprabha Vati strengthens urinary bladder, reduces incontinence and decreases frequency or urination. * Twice a day or as recommended by physician. The maximum dosage of mastic gum should not exceed from 6 grams in a 24-hour period. Mastic gum can be taken alone with warm water. In ayurvedic and Unani medicine, it is used with other herbs and some of these combinations are provided in Benefits & Medicinal Uses Section of this article. The recommended treatment duration with mastic gum ranges from a minimum of 2 weeks month to a maximum of 6 months. Mastic gum is POSSIBLY SAFE & TOLERABLE in most people within the therapeutic dosage of Mastic gum. Unani and ayurvedic ancient texts believe mastic gum is not suitable for kidneys. The extract form or principle alkaloid and mastic oil are more likely to cause the side effects. Mastic gum excessive use in higher dosage exceeding 4 grams per day may also cause following side effects. If blood appears in the urine due to mastic gum, then antidote of mastic gum should be used. Myrtus Communis (Myrtle) – Vilayati Mehndi – Leaves juice should be used to treat blood in the urine due to mastic gum. The reliable information about the safety of mastic gum in pregnancy and breastfeeding is not available. Therefore, it is better to avoid mastic gum use in such case. As per ayurveda and Unani medicine, mastic gum should not be used in following diseases. Have you encountered severe side effects with mastic gum causing a gastroparesis event? Here in the USA, I’m encountering a subsection of people like myself who are having severe issues with this resin. Very little info available! Honestly, I have never encountered any case in which mastic gum caused gastroparesis. It might be because we use it rarely and in a combination of other herbs. We never use it alone and more than 1 gram per day. We use it in a combination of other herbs. I have already written some of the combination in this article. In combination, we use it in a dosage of 125 to 500 mg twice daily. According to Ayurveda, it has astringent action and it is sticky too. In high dosage, it makes your bowel slow, you can experience a delay having a bowel movement, and it can cause severe constipation. This action occurs in the lower part of the alimentary canal when it is used alone and in high dosage (more than 2 grams per day). The effect is also dose-dependent. Some people can even tolerate high dose, but some people are unable to tolerate it even in low dosage. We observed delayed bowel movement in most of the cases. Similarly, it can also occur in the stomach. It might also cause delayed gastric emptying i.e. Gastroparesis, as you discussed. In low dosage, it is beneficial for the stomach, but in high dosage, it can become toxic for it. Similarly, in low dosage, it helps to treat gastritis, ulcer, ulcerative colitis, etc., but in high dosage, it can cause the same problems. According to ayurveda, it has hot potency and in low dosage, it is still in the balance due to other qualities of mastic gum. In high dosage, its hot potency overtakes the other qualities and causes burning pain in the abdomen, bleeding in urine, severe gastritis, and kidney diseases. During a bowel movement, anorectal pain can also occur with it due to constipation, its side effect. In my opinion, one should not use mastic gum alone when other better alternatives are available. It should be better when combined with other herbs. I am so grateful for your response! I’m now into day 5 after having a severe reaction. The same thing happened after slippery elm bark and another time after consuming a chia seed desert (soaked chia seeds). I have read stories of people having this same type of reaction albeit rare. I seem to always fall into the rare category, and after searching, I’m finding other people like me who are advised to take a folk medicine which many praise, only to be made ill by it. In all my years of trying to understand why my body is so reactive, I always come back to Ayurveda. Thank you for sharing your knowledge, it is very hard to find knowledgeable practitioners here in the US.